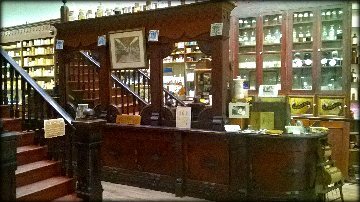 The compounding bench here in the Museum is where the Pharmacist prepared the prescriptions received from the patient’s doctor. A prescription often contained several and sometimes many ingredients in varying proportions. The Pharmacist would accurately measure the prescribed amount of each ingredient and then combine them into a powder or a pill or a salve or a tonic or some other form for administration to the patient. The compounded medication would then be presented to the customer. 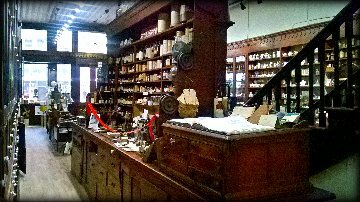 The Museum’s Pharmacist’s bench displays items such as a pill machine, folding paper for the prepared powders, powder boxes, empty capsules for filling, handmade pills, and various chemicals and other items necessary for the compounding of the various prescriptions.